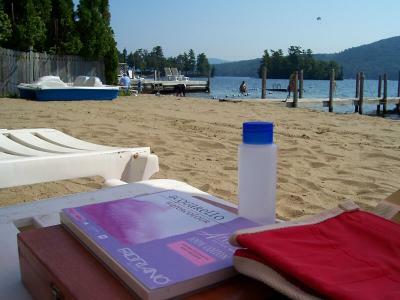 I just got in from a couple of days at Lake George, New York. What a beautiful place to relax and paint. 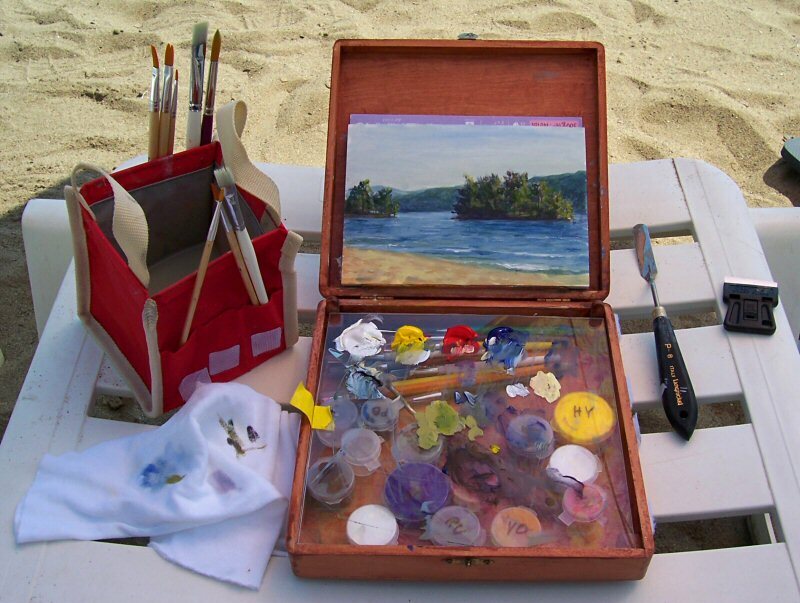 I usually don’t get to paint much during family trips, but one morning when we were all at the beach, I pulled out my little pochade box and did this 5×7 under the shade of a nice, big beach umbrella. I did get some great photos to work from one night when we went on a sunset cruise. We also drove up Prospect Mountain, which has 100 mile views, and took some pictures up there. 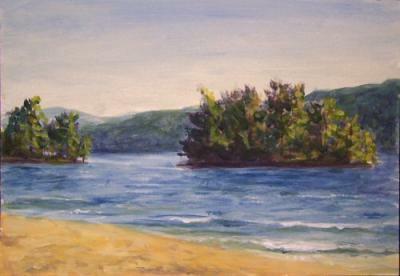 So, there should be more Lake George paintings coming along in the near future. Stay tuned! I don’t think any explanation is needed for this one! $860.00 plus $30 shipping and insurance within the Continental United States. For local sales, shipping charge will be allocated to NYS Sales Tax. Please email me at JamieWG@aol.com for International purchases or with any questions. 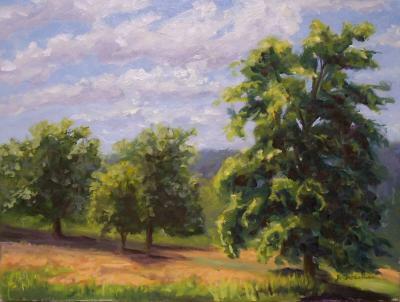 This is another plein air painting from Ward Pound Ridge Reservation. 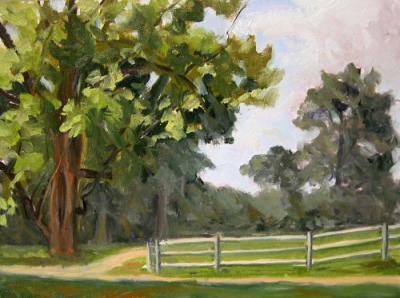 It was done over a period of several days’ painting on location, and a little studio time as well. This scene was painted from the same location as “Brenda’s House”, facing a different direction. I love that spot! This painting was done mostly en plein air (on location) at Ward Pound Ridge Reservation, and just needed a little time in the studio to finish it off. I pulled it out today to put on the final touches. Now it’s ready for a new home! The Garden Club has been very busy dressing up the island with gorgeous annuals and perennials. This flower and vegetable garden below the residence castle has an exquisite view downriver. I painted it on location the other day in a vertical format, but I like this horizontal a lot better compositionally. I’m starting to work from the photos I took at Bannerman’s Island on Friday. This was the very beginning of the excursion, as the boat circled the island before approaching the north shore. It’s a beautiful morning view as the light strikes the structures, and the still water made for vivid reflections. Someday I’d like to do a large painting of this scene. The large structure is the Bannerman Armory. 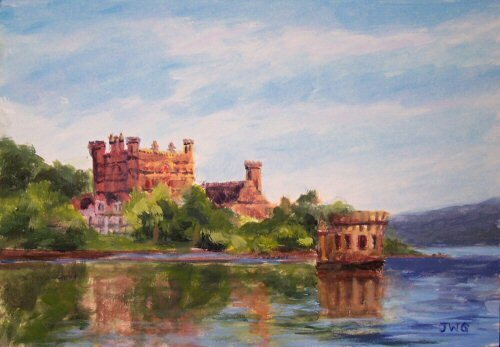 The small structure on the right is one of the towers in the water, which was to be part of a large entrance bay to the island. $100.00 plus $6 shipping and insurance within the Continental United States. For local sales, shipping charge will be allocated to NYS Sales Tax. Please email me at JamieWG@aol.com for International purchases or with any questions. 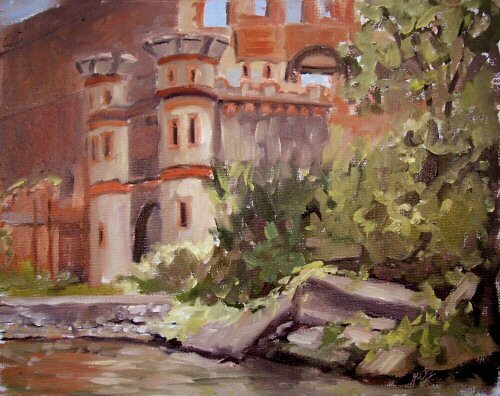 This was painted on location at the Stone Barns (Rockefeller property). These cute chicken coops on wheels are moved around the fields on the property. 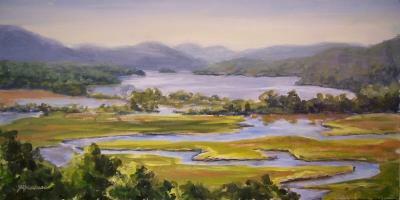 This painting was done on location at Boscobel Restoration. It is the famous overview of Constitution Marsh and the Hudson River. I set up my easel in the cool shade under a big tree along the bluff. I think I’ve painted from this spot in nearly every season and every size. 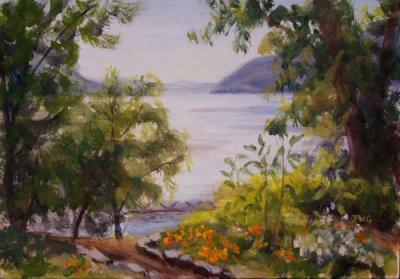 It occurred to me that I hadn’t done an 8×16″ summer view of the scene, so here it is for the very first time! 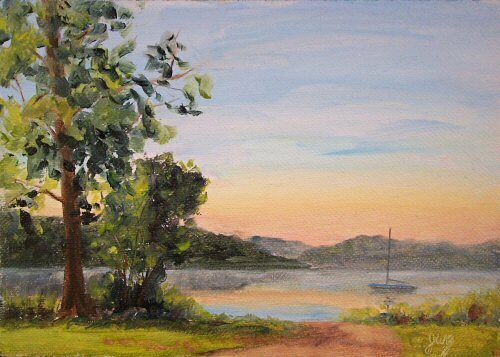 I was up and out before dawn again today, setting up to paint by the lakeshore. I’m really enjoying these early mornings of spectacular light and calm atmosphere. I was set up right on the path leading down to the water, taking in the sights and sounds of dawn. Welcome to all the USA Today Readers! Welcome to all of you who are visiting my blog as a result of the article in USA Weekend. 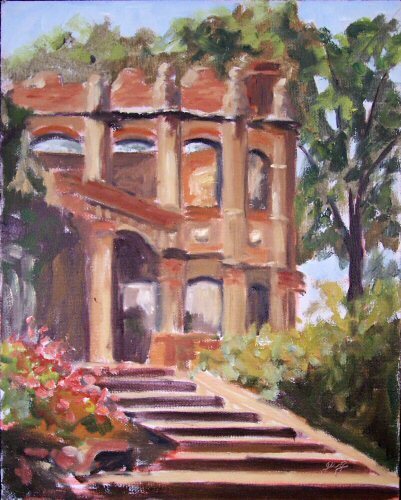 Please email me from the link at the top of the page with any questions, and feel free to leave your comments on the paintings using the “Comment” link in each post. I hope you enjoy looking through my online gallery of original art here. Works can be purchased securely by credit card or bank transfer by clicking the Paypal button in each post. You can subscribe to receive updates to my site by clicking the Subscribe link at the top of the page. 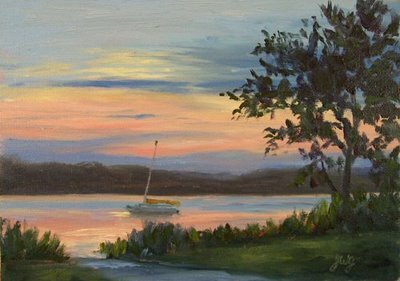 If you live near the Hudson River Valley and wish to attend my art shows and events, you can receive my mailings by clicking the “Be Notified of My Exhibitions” link at the top and entering your contact information. This info will not be shared; it will only be used to notify you of my art events. Many thanks for visiting my blog. 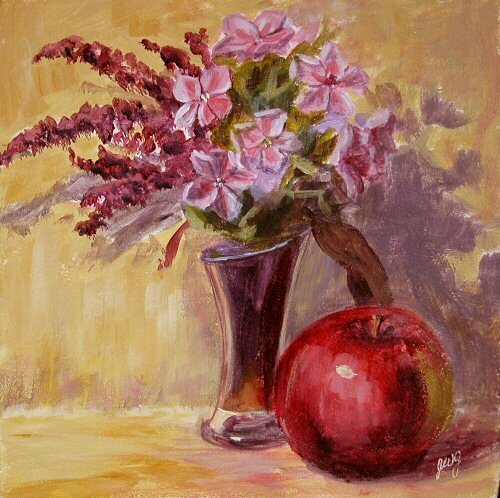 I hope you enjoy the work and return often, whether to purchase art or just enjoy viewing! I went to the Brewster Farmer’s Market on Wednesday and bought a beautiful bouquet of wildflowers and some early Macintosh apples. I picked out a few flowers tonight to put in this tiny vase, which I’ve always wanted to paint, but somehow hasn’t yet made it into a painting. I set up the still life in my studio and painted it from life. Now I’ll get to eat the apple and enjoy the flowers for the next few days. 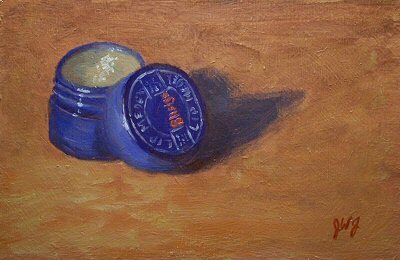 My palette for this painting was Ultramarine blue, Hansa yellow, Alizarin Crimson hue, Yellow ochre, Titanium white. I just got back from my trip to Golden Artist Colors headquarters earlier today. What a wonderful experience it was to go there! I picked the brains of some of the very knowledgeable staff members regarding sealing supports and isolation coats before varnishing. I always seal my boards with GAC100; they verified that they feel that is the best sealer for the job. They recommend Soft Gloss Gel mixed with water in about a 2:1 ratio for the isolation coat, so I’m going to get some of that asap. In the meantime, I am busy enjoying acrylics again! 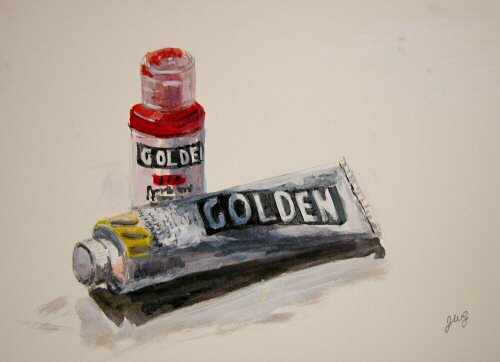 Golden Acrylics in Golden Acrylics and going to Golden Acrylics! $50.00 plus $5 shipping and insurance within the Continental United States. For local sales, shipping charge will be allocated to NYS Sales Tax. Please email me at JamieWG@aol.com for International purchases or with any questions. 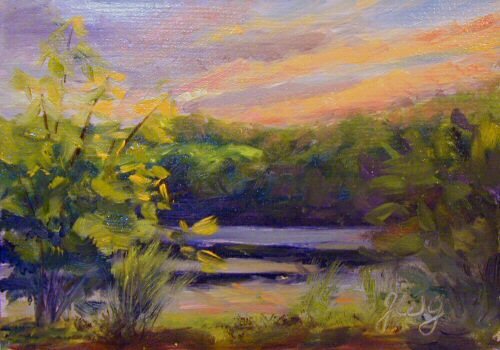 I painted this acrylic sketch last night in anticipation of my exciting trip to Golden Artist Colors today. I’ve been invited to their headquarters in New Berlin, New York. Painting Golden Acrylics using Golden Acrylics seemed to be the perfect still life setup for the occasion. I’ll post all about it when I return tomorrow. It was brutally hot today. 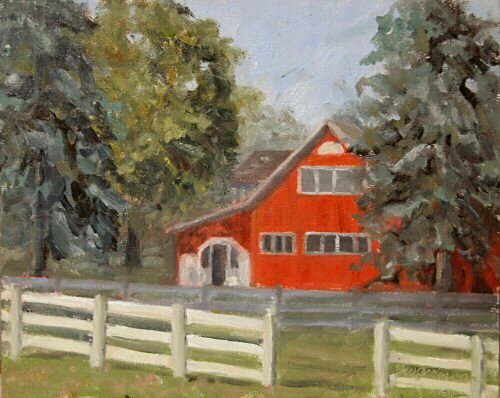 I wanted to paint the Rockefeller Stone Barns, but couldn’t find a shady vantage point. I wandered around until I found a shady spot with picnic tables. There was a lovely view of this stunning oak tree beside a path and field, so I was able to enjoy some much-needed shade while painting. This was painted from a photo of a friend’s boat at sunset. $95.00 plus $10 shipping and insurance within the Continental United States. For local sales, shipping charge will be allocated to NYS Sales Tax. Please email me at JamieWG@aol.com for International purchases or with any questions. It’s overcast and threatening to rain today, so I went through my Acadia National Park photos and selected this scene for today’s painting rather than venturing out to paint en plein air. It brought back wonderful memories of being up in Maine, wandering along the trails by the ocean. 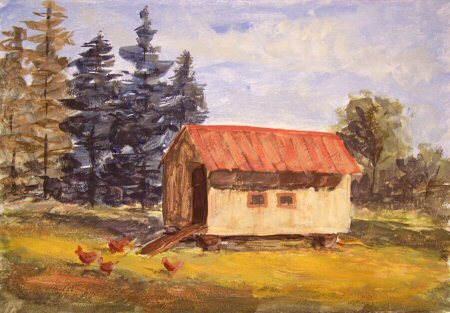 This is gouache (opague watercolor) painted on 100% rag, archival Fabriano paper. 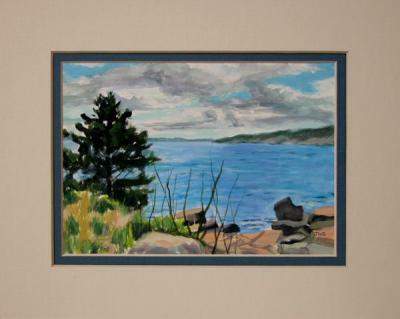 It is matted in an ivory mat with a blue liner that shows off the blues in the painting and complements any decor. It’s all ready to pop into any standard 8×10 inch frame. It was way too hot to be standing out in the sun doing this painting on location! My EasyL painting umbrella saved the day, though I was still pretty cooked by the time I was done. The late afternoon light against the side of the red building at Tilly Foster Farm made it glow red-orange. This building is the current home of the Putnam Arts Council. They are renting the space from Putnam County while their old headquarters is being rebuilt following the terrible fire this past winter. 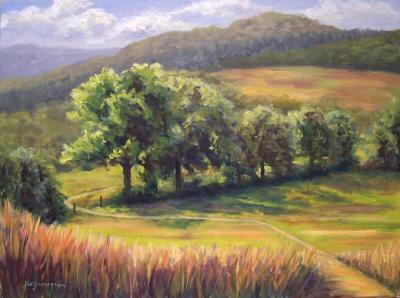 The rolling fields, barns and pastures of Tilly Foster Farm are a perfect setting for artists! I painted this yesterday morning at Ward Pound Ridge Reservation in Pound Ridge, New York. 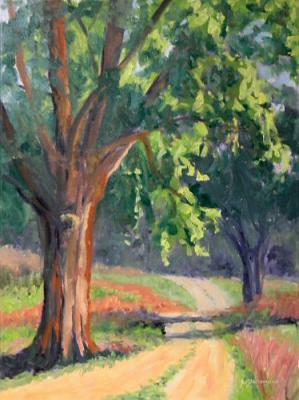 It was a beautiful, clear summer morning before the heat struck, and the tree and path were lit up like Christmas bulbs.